Every now and then a band sits right on the edge of my thoughts. I hear their name, I see folks mention them, and I sometimes even take a minute or two to research them online, but I don't give them a proper listen because I've usually got dozens of bands on my "to hear" list at any given point. Such was the case with Wulkanaz until the past week or two. After months of hearing the name, I finally gave the Wulkana EP a listen and realized I'd seriously been missing out. Two days later, I got word that Wohrt Records was about to release the newest Wulkanaz tape. Needless to say, obtaining a copy for myself was mandatory. 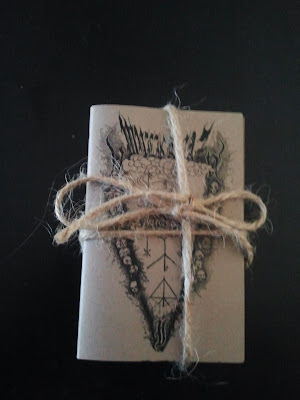 While the tapes are already sold out at the label, I feel that mentioning Wohrt's efforts on my blog is long overdue, and this release is proof of it, even if the majority of my readers will struggle to find this music. The first thing I must say is that the packaging and presentation are above average, which is always rather satisfying to me. 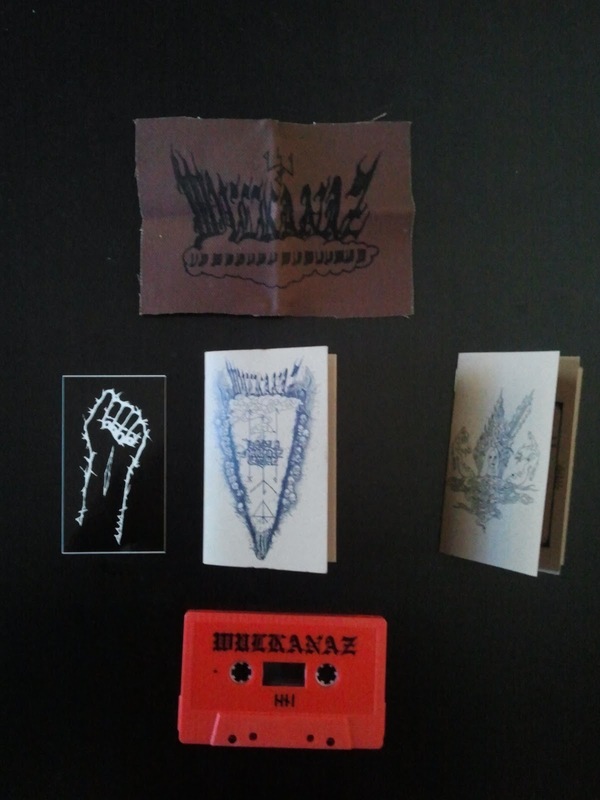 In addition to a hand-bound booklet to house the cassette, this release comes with a patch and a sticker. It's a simple detail that really adds up as a fan of music. Bonuses like this are what can help entice the younger generation realize that owning physical copies of music is more rewarding than simply pirating a collection of mp3s. As if the stellar packaging weren't enough, this cassette is everything one would hope for from a respectable artist and a high quality label. The A side opens with chanting voices in a ritualistic fashion, setting the perfect dark atmosphere for the stripped-down, driving black metal that the subsequent tracks provide. While some black metal feels rooted in tremolo picking and thick atmospheres that are more for listening than performing, I can imagine these songs would translate quite well in an intense live setting if Wulkanaz were not a solo project. The drums and guitar play back and forth in a way that causes me to involuntarily bob my head. I promise you'll do the same. This is well executed black metal in a very simple and pure form. The riffs are instantly memorable due to their clarity and frequent repetition. Where some bands would come across as monotonous, Wulkanaz instead uses repetition to create an instant familiarity with each song. I've only listened to the tape twice so far but even on my second listen, I can instantly recall the tunes and find myself enjoying them just as well as I did the first time. While this tape is off the market already, I highly advise my readers to keep an eye out for future Wulkanaz releases. This music is simply amazing. While there is certainly a sense of variation from song to song, the lack of frivolous additions to the music is refreshing. Everything that Wulkanaz presents feels like it needs to be in the song, nothing more. Additionally, while this is Wohrt's newest release, expect me to cover the back catalog of Wohrt Records over the next few months, as almost every cassette I've received from this label should be considered necessary listening.